Officials from the Philippine Navy and Department of National Defense together with the recently launched BRP Tarlac (LD-601) in January 2016. Vessels hailed as an upgrade for the country’s military capabilities. The Philippine Navy officially commissioned four additional vessels Wednesday as the service commemorated its 118th anniversary. The country commissioned the new landing dock vessel BRP Tarlac – an Indonesian-made ship and its biggest to date – along with three newly acquired landing craft heavy vessels from Australia. The BRP Tarlac, a Strategic Sealift Vessel (SSV)-1 built by Indonesia’s state-owned shipbuilder PT PAL, was delivered to the Philippines earlier in May. According to previous specifications released by PT PAL cited by IHS Jane’s Fighting Ships, SSVs measure 123 meters long with a beam of 21.8 meters and a draught of 6 meters. As I have written earlier, the vessels, which have a full load displacement of about 11,583 tons, a maximum range of 9,360 nautical miles, an endurance of 30 days and a top speed of 16 knots, will help the Philippine military meet sea-based transport and logistics requirements (See: “Indonesia to Export First Ever Warship in Boost for Shipbuilding Industry”). The Tarlac was delivered as part of a contract PT PAL secured back in 2014 worth $92 million to deliver two SSVs to the Philippines. The other SSV is expected to be delivered by mid-2017. The Philippines also commissioned three newly acquired landing craft heavy (LCH) vessels it had received from Australia. The three LCHs, formerly ships of the Royal Australian Navy, had arrived in late March and are the last of a set of five vessels Manila acquired from Canberra. The first two – the BRP Ivatan (formerly HMAS Tarakan) and BRP Batak (formerly HMAS Brunei) –were donated and commissioned into the Philippine Navy (PN) last year, while the three newly arrived vessels were sold to Manila for a ‘friendship price’ of 270 million pesos. LCHs – versatile vessels capable of moving large amounts of cargo, personnel and equipment from larger ships to shore – improve the country’s sealift capability, enabling it to undertake humanitarian assistance and disaster relief (HADR) operations more efficiently as well as boost its capacity for amphibious transport. As I noted earlier, this sealift capability was found lacking following Typhoon Haiyan in 2013, the deadliest Philippine typhoon on record that killed more than 6,300 people (See: “Australia Gives the Philippines Another Military Boost”). The commissioning of the newly acquired ships coincided with the Navy’s 118th anniversary, presided over by President Benigno Aquino III in what was his last military event as commander-in-chief before president-elect Rodrigo Duterte officially succeeds him later this month. 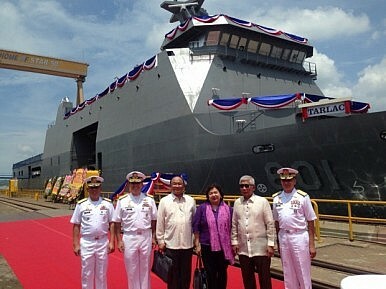 Aquino touted the commissioning of the ships as part of an ambitious modernization program forged under his presidency. Navy chief Vice Admiral Ceasar Taccad emphasized the urgency of upgrading the country’s capabilities in the face of rising threats. “Today, the enemy stands at our doorstep and we can no longer over-exaggerate the urgency of the threat against our maritime interests and possibly our territorial integrity,” he said. Tanker collision results in minor damage. Australia Gives the Philippines Another Military BoostWill Philippines Get More Indonesia-Built Warships?Philippines Receives Second Indonesia-Built WarshipPhilippines Creates New South China Sea Task Force What’s in the New Philippines-Croatia Military Pact?